Director Robert Zemeckis takes us gorgeously into the heart of Morocco at the start of Allied as Steven Knight’s script deposits Canadian war agent Max Vatan into the heat of the anti-Nazi espionage, to meet French colluder Marianne Beauséjour for a mission dangerous, deep, deadly and … yes, romantic. 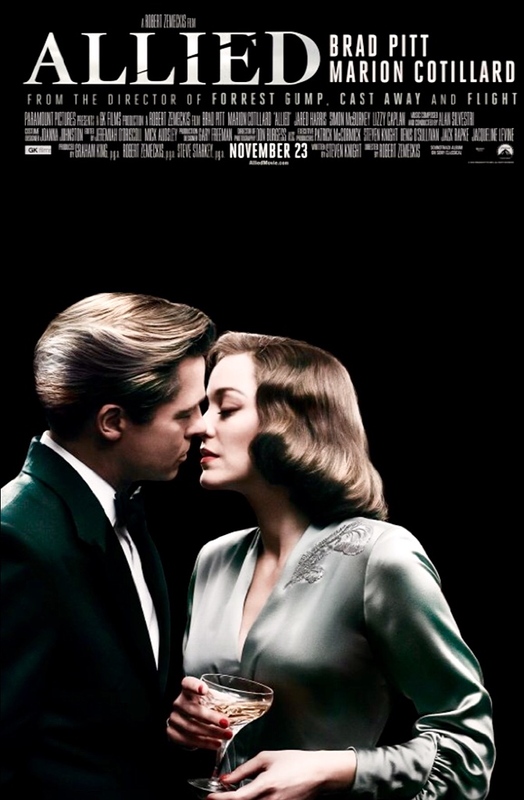 Pitt and Cotillard’s characters pair off to accomplish their long and mysterious mission against the Nazi embassy, pretending to be a married couple with he returning from work in Paris. She teaches him the local customs, including some nighttime smooching up on the rooftop. He takes to the work. She’s as good at what she does as he is. After their job success, he convinces her to go with him to his station in London, where they wed and have a daughter. War rages around them as he attempts to live a split life of sorts, military man to the max as well as super husband and father. She, meanwhile, enlists with an artsy crowd of which he knows not much. It’s all quite fascinating, really, this Blu-Ray on the flat screen. They’ve got my dear wife Karen and I hooked, and good. Pitt and Cotillard sort of sizzle. Then his higher-ups call him into the office with shattering, awful, worst-case scenario news that must put his soul to the test on both the job and home front. And, somehow, this story starts to slow down as his heart and mind race. Max’s attempts for a solution to this dilemma of soul and mind meet too many dead avenues. I can’t find honor in the ending, and turn of the Blu-Ray player with a frown. What’s your favorite Brad Pitt movie, and why? What’s your favorite Robert Zemeckis flick, and why? We’re always looking for movies to watch streaming or DVD, I’ll have to look this one up, thanks for the review! I hope you think it was worth the time, Kathryn Grace. I hope you think it was worth the go, Beth.